Electronic gadgets outnumber grocery items in a household these days (‘A different waste model’, June 1-15, 2010, and ‘IT’s underbelly’, May 16-31, 2010). What’s more, software-based devices such as cellular phones, cameras and computers have a short lifespan due to fast-growing research and constant innovation. What is a breakthrough today becomes outdated in a year. This results in piles of e-waste every year. Can’t manufacturers of these products retrofit gadgets, of course for a price, whenever technological innovation takes place? If this is possible, the government must mandate electronics companies to bear the responsibility and add necessary features in existing gadgets so that they are on par with the innovations. This will not only check the mounting e-waste, but also a middle-class family’s budget. Cheap emergency lights powered by leadacid batteries have reached every corner of our country. People use the lights and throw them away when the battery runs out. Most people are not aware how to re-charge them. As a result, 90 per cent of the lead-acid batteries end up in landfills and pollute the environment. [Lead is extremely toxic. Long-term exposure to even tiny amounts of lead can cause brain and kidney damage, hearing impairment and learning problems in children.] We must improve our recycling system. Sellers of such products must be mandated to collect the batterries from consumers and send them back to manufacturers for recycling. An old ship containing hazardous materials is ready to retire. Let us consider how it can be disposed of. We cannot bury the ship nor can we sink it in the ocean. In either case, the toxic-laden ship would pollute the environment. So the only way left is to dismantle the ship, so that the volume of its hazardous materials can be reduced. If India does not import the ship for dismantling, then the ship can dock in several countries like Bangladesh and Sri Lanka. 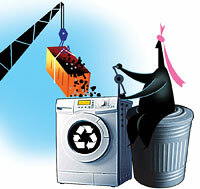 Recycling industries there would dismantle the ship and earn money. This is not to endorse the recycling business in India, but to find a way for capitalizing on resources in a cautious, regulated and scientific way so that it benefits us while nobody gets hurt. Dealing with India’s waste is our responsibility. The government fails to manage it because of the obvious weakness in the system. But importing waste from other countries and reprocessing them in India should not be discouraged as it generates revenue. It can be beneficial if handled in the right manner. Both the government and private organizations involved in the recycling business must take strong steps to ensure that the waste handling and recycling industry transforms into a clean operation and that people working in the unorganized sector are not exposed to dangerous toxins. To curb the amount of e-waste making way to landfills, people should be made aware of how to reuse the waste. Why no craze for agriculture? As soon as the admission season starts, advertisements of engineering colleges fill newspapers and hoardings. Every college is seen wooing students to join the course. In Tamil Nadu alone, more than 300 engineering colleges are in the race. But at a time when India’s food production is low why are agricultural colleges making no such effort to attract the young generation? Is it because they do not receive enough encouragement from the government? Unless this changes India’s future is bleak. I want to know about methane emissions from cattle and agriculture. Please see articles ‘Paddy cultivation reduces global warming’, April 15, 2008; ‘Methane from Indian cattle overestimated’, January 15, 2007; and ‘Livestock production and global warming’, January 31, 2006. With so much of sunlight, India is in an ideal position to harness and use solar energy (‘New gold rush’, June 1-15, 2010). We may not have large areas to set up solar energy farms but rooftop units like the one set up by Omax, an automobile parts manufacturer in Gurgaon, are possible. In fact, all medium and large industrial units should be mandated to generate at least 5 per cent of their electricity needs from solar energy. Various states in the country have mandated rainwater harvesting in new buildings. Why not mandate solar energy production as well? We lose half of the water supplied because of frequent leaks in supply pipes. Most of the time, leakages go unnoticed or take long time to trace. Is it possible to develop a software which can help water supplying authorities monitor the entire pipeline and spot leakage the moment they occur? This would ensure prompt action and save water. Let’s not forget that drinking water is precious. India is endowed with many rivers. But misuse of water by urbanites is causing water scarcity all over the country. Here are a few points to ponder. Most institutions in the cities are supplied with soft water. They still install reverse osmosis (RO) systems, which waste more water than they purify— almost in the ratio of 60:40. Most households are also blindly installing RO systems. Group housing societies in cities heavily depend on groundwater. But hardly any housing society bothers to harness rainwater to replenish the depleting groundwater. Swimming pools are becoming an integral part of schools and clubs. They require a large amount of water. I am sure there are other activities that don’t involve use of so much water. Water parks should also be banned. All housing and office buildings have single pipe connections, which supply drinking water even for flushing toilets. Most toilets are designed to flush over 10 litres of water in one go. Should not the city authorities make arrangements for dual pipe supply so that only recycled water is used in toilets? People should opt for designs that have dual mode for flushing urine and stool. I have a few words of advice for the Mendha Lekha community of Gadchiroli district in Maharashtra (‘Two tribal villages get 2,349 hectares’, September 1-15, 2009). Now that they have got the community rights over the forest, as per the Forest Rights Act, officials cannot stop them from collecting bamboo or any other non-timber forest produce. In case they do so, the community members can approach the district collector and file a case against the violation. It is high time cotton farmers switched to conventional cotton, which yields as much without harming the environment and with far less inputs as required by Bt cotton (‘China Bt farmers at loss’, June 1-15, 2010). Conventional cotton farming may not offer over-productivity but it ensures profitability. 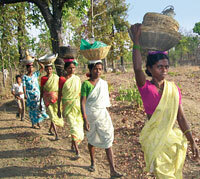 Farm input costs in India have increased five times since farmers started using Bt seeds. The government should stop playing into the hands of industry. Sarath Guttikunda, quoted in the article ‘Delhi’s wake up call’ (June 1-15, 2010), is deputy programme manager of Aria Technologies and not a consultant of the Central Pollution Control Board (CPCB) as reported. The consultancy firm is currently working on the air quality forecasting system with CPCB. We regret the error. The Commonwealth Games are just round the corner. Thyagaraj Stadium, near INA colony in Delhi, has been groomed as the country’s first ecofriendly stadium to host the netball competition. But the area surrounding the stadium is highly polluted. There are several workshops for repairing motor vehicles and painting cars, coolers and almirahs. They operate in the open and pollute the atmosphere with toxic chemicals. Asthma patients in the locality are facing difficulty because of the pollution. Then there are open drains emitting putrid smell and polluting the land. I wonder how the athletes will perform their best in such an environment. Does the government have any plan to clean up the locality surrounding the stadium before the games? The New Delhi Municipal Council and the Municipal Corporation of Delhi are responsible for keeping the environment clean. But what can one expect from them given the fact that colonies maintained by these civic bodies are the most polluted areas in Delhi. Recently, we spotted a tiger in the Kullu valley. It appeared to be a cousin of the Siberian tiger. We had spotted the tiger last year as well. This year we saw the animal roaming at a higher altitude, near the snow line. We have taken pictures of the tiger and its pugmarks. We have kept the information secret so that people do not panic and harm the animal. We need help from experts to confirm the tiger’s presence and help protect the species at this new location.